Click to enlarge for more details. 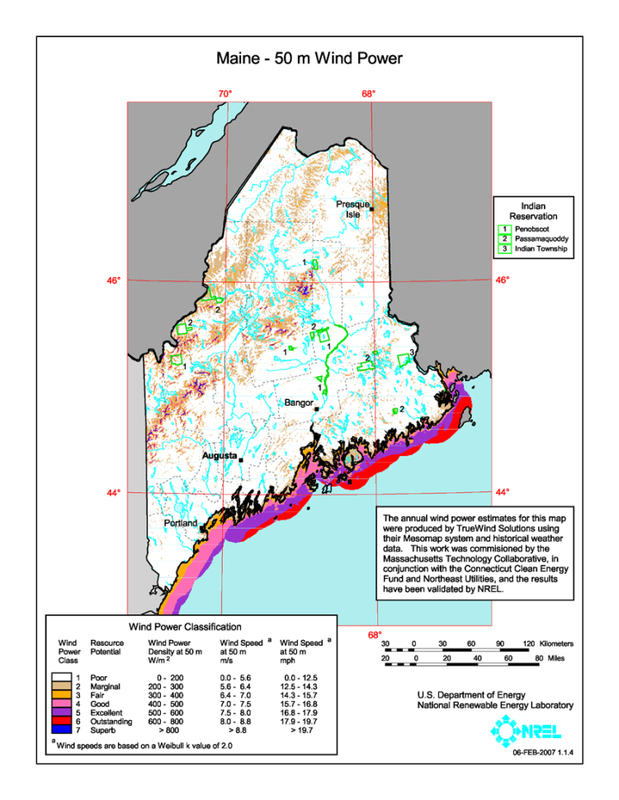 MAINE IS A POOR WIND STATE – Existing Maine grid scale wind projects produced wind 27% of the time (based on Federal Energy Regulatory Commission Reports and the Energy Information Administration). Twenty percent of the power produced is used keep these massive turbines from seizing up when the wind isn’t blowing. Seven percent of the power generated is lost in transmission. The result is in truth, very little energy production. WILL WIND GET US OFF OIL? – Because wind is so unreliable, back up fossil fuel electrical generation facilities have to be at the ready to pick up when turbines are idle. IS WIND GOOD? – Maine is third in carbon capture behind Idaho and Vermont. Every time a wind project is erected, millions of trees are cut down weakening our carbon capture capability. Wind turbines destroy mountain ridge tops, wildlife habitats and birds and bats. Maine is directly in the migratory flight path for millions of birds representing hundreds of species who fly north every year to Canada’s boreal forest. Wind turbines are themselves polluters. 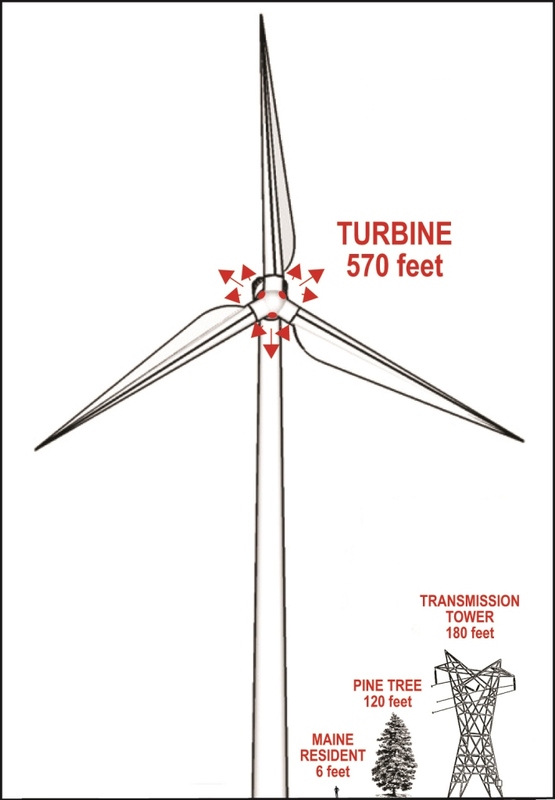 The nacelle of each turbine needs hundreds of gallons of oil to keep turbines from seizing up. A turbine fire where, there is no capacity to fight the fire can be devastating. ARE WE HELPING TO FIGHT CLIMATE CHANGE USING WIND TURBINES? – Maine is already a leader in fighting climate change! We are not the polluters. Only 14% of our carbon emissions come from electrical generation. Maine no longer uses coal or oil to produce electricity. And every tree that is cut down for a wind turbine increases Maine’s carbon footprint. Nearly 50% of Maine’s electricity comes from renewable sources – hydropower and biomass, and we are the first state in the nation to have tidal hydro projects. Because of poor performance after 6 years only 1.5% of electrical energy comes from wind. The wind energy industry exaggerates its carbon offset data and wind production. IS WIND AFFORDABLE? – The truth is Mainers pay for wind energy several times over. Wind is a heavily subsidized industry. Wind developers use government loan guarantees, energy tax credits, production tax credits, carbon cap and trade credits, and a 30% investment tax credit taken when the project is completed. Government programs such as tax increment financing are also used to subsidize projects. Projects can also be written off with 5 year depreciation plans offering further tax reductions to developers. So in addition to paying higher electrical energy rates, tax payers subsidize projects with their tax dollars. ELECTRICAL ENERGY RATES HAVE INCREASED WITH WIND ENERGY – Mainers are already paying higher transmission rates – 20% more! The cost of new transmission lines to service grid scale industrial wind projects gets passed directly on to the consumer. In addition, Maine electrical utility providers have to buy wind energy at the highest avoided cost, the cost of oil generated electricity. COMMUNITY BENEFIT IS COMPLETELY OVERSTATED AND PROPERTY VALUES HAVE PLUMMETED WHERE WIND PROJECTS ARE LOCATED – In areas where wind projects have been erected property values have dropped significantly. In some instances it is impossible to sell real estate. Wind developers have begun buying or offering a guarantee of home value to convince local residents to allow the development. The resulting drop in housing value has a negative impact on community benefit. DOES WIND ENERGY CREATE JOBS AND BRING MONEY TO THE STATE? – Wind energy uses existing construction workers short term while facilities are being built. There are no long term jobs created. Maine gets no direct income from wind developments – in fact, 70% of energy generated by Maine wind projects gets shipped out of state to other New England states with not a cent coming to the state of Maine. ARE WIND DEVELOPERS GOOD CORPORATE CITIZENS? – Wind developers capitalize on ideology and ignorance. They take advantage of the desire to save the earth and stem climate change, and exaggerate the truth to capture support from intelligent but uninformed Mainers. Once a wind project is up, the wind company is gone except for a skeleton crew. MAINE HAS A FLAWED EXPEDITED WIND LAW – Maine’s expedited wind law was hastily written with little or no public review. The area designated for “expedited” wind is in the section of Maine with the poorest category of wind. The wind law fails to take into consideration migratory bird paths and requires no audited or in depth financial information from wind developers either on the company financial health or the project costs. Wind companies use a flawed expedited wind law that calls for community benefit to legalize bribery, paying off citizens with energy subsidies, gifts of flat screen TVs, giving huge donations and grants to environmental and other local organizations, and political donations to candidates who support their activities. This was evidenced recently when the Maine Legislature put wind developers ahead of citizen’s rights when they refused to give Mainers living in Unorganized Territories the right to a public hearing on wind projects. THE WIND ENERGY SECTOR IS NOT A STABLE SECTOR – European countries such as Germany are running away from wind energy. The largest developer of wind in Germany promised investors a 20 percent return on investment and has produced only a 2.5 percent return on investment, the result of poor energy production of projects. In Maine, the largest wind developer, First Wind, was founded by three former Enron employees. First Wind has already had a failed IPO, a failed joint venture with Emera, owner of Bangor Hydro, and now is trying to sell $75 million in junk bonds to prop themselves up. Is First Wind a house of cards about to topple? WIND TURBINES ARE HAZARDOUS TO HUMAN HEALTH – Scientists are now documenting serious negative health concerns caused by living in proximity to wind turbines. In addition to hearing loss, wind turbines can cause vertigo, nausea, increase in blood pressure, tinnitus memory dysfunction, increased stress and sleep deprivation. Thanks for presenting the truth. The truth shall set you free. The environmental and health effects of turbines and farm construction are terrible, and without enormous government handouts the entire global wind energy sector would fold in less than a year. Truth will always win over lies. Tragically, innocent people will have to loose their homes, special places, and wildlife survival will be threatened. It is a travesty that our once effective environmental agencies have become the destroyers of our special places! Shame on them. Thank you for all you have done from many of us who have been in this fight since the inception of the “heinous” wind law of 2008. You represent the “New Blood “in the fight , and many of us are gratified and humbled to see others pick up the baton from those like myself that have been at this a very long time. As I always have said, the leverage is on our side. For $250 K, we will slow them, for $500k , we will stop them. For 1 million, We will put them all in Jail! At the beginning of the wind craze, I thought it was a good idea. Little did I know we were dealing with a Frankenstein. I came to realize that we were being suckered, and Maine was being sacrificed for the benefit of charlatans from away. Once the damage is done, it’s done. We are the ones who have to deal with wind’s dirty laundry. During the creation of the expedited map (which was a closed door process) there was no tourism expertise in the room that could have informed a group ignorant of this economy. There was no understanding of how Maine’s woods, waters, and wildlife (whether used for forestry, fishing, tourism, or more…) is our first and primary infrastructure.There was no discussion of the Maine Brand: the image and reality of wildness that draws millions of tourists inland. No understanding how these areas, intact, are multi-billion dollar revenue generators. It is simply unacceptable that one industry, claiming jobs (fraudulently), can degrade or cripple another essential Maine economic sector. crosbyh75@hughes.net. Perhaps Andy Torbett could add something to what has already been written. I have not been able to list any specifics, but I suspect a former governor of the Pine Tree State and US Senate member may have been the recipient of taxpayer largess through clever wind legislation. Perhaps others who read this may have more information than I. Thanks if you do. Why can’t you notify John Cruso on channel 13 to get this” Exploiting Maine to save Rhode Island” on tv? Trans Canada Co has their sights on the Moosehead-Jackman region. They are planning testing and permitting for the beautiful mountains and ridges from Rockwood west and a power line from Canada to The Forks. These projects do not belong in this area or on most mountains of Maine.